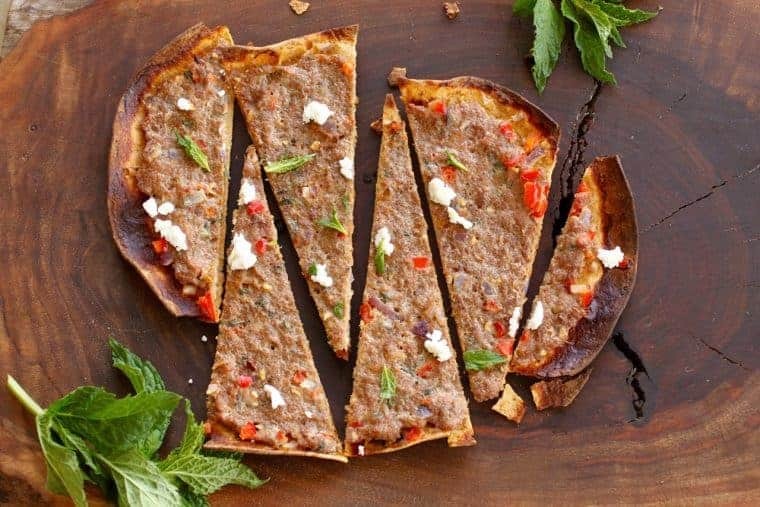 Grilled Turkish Turkey Flatbread is fast, delish and nutrish with a spicy kick! We wrap. We roll. We dip. If bread is the staff of life, variety is what keeps it interesting. The world has flattened so that we scoop curries and hummus with naan, fold pita around gyros and souvlaki, stuff arepas with beans and cheese, and wrap tortillas with nearly everything. If you prefer not to make dough, you can heat and eat because many of these breads are available in your grocery store. Check the bread aisle, deli and frozen foods sections. So many breads, so little time. What you do with them? Spread with hummus, layer spinach, thinly sliced cucumber, olives and pine nuts. Consider this a sandwich or roll and slice into ½-inch rounds for an appetizer. Toast bread in the oven, brush with Greek-style plain yogurt, sprinkle with cinnamon, sugar, and chopped walnuts. Spread with ricotta cheese then layer with blueberries and sliced strawberries. Drizzle with honey. Spread with peanut or almond butter, jam and sprinkle with toasted coconut. Spread Dijon mustard over toasted flatbread. Top with smoked salmon slices, chopped red onion and capers. Cut into wedges. 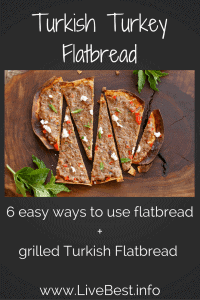 And now here’s what I did to recreate a grilled flatbread that I’d eaten in Turkey. 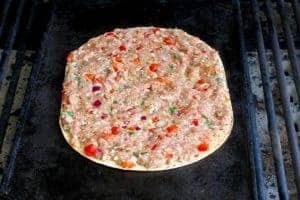 I spread a meatloaf mixture on a flatbread and grilled it. 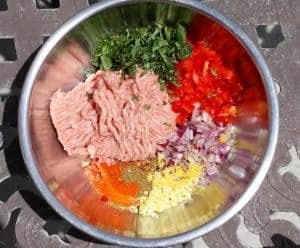 More specifically, I spiced ground turkey with chopped vegetables and herbs, thinly spread that on the flatbread and grilled it. I was skeptical because one, I thought I would end up with a greasy mess and two, I didn’t think the meat would cook thoroughly. Wrong. The bread was crisp and dry and the turkey was cooked. So I made another. And another. Cut the vegetables into small pieces so they cook evenly. 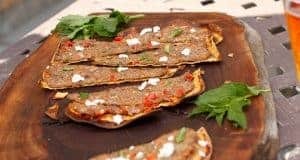 Spread the meat mixture thinly over the flatbread and push it out to the edge of the bread. Heat the grill to 350° – 375°F. before cooking the flatbread. Spray the griddle or grill grates lightly with cooking spray before placing flatbread on the griddle. If cooking on grates, use indirect heat so bread doesn’t burn. Keep the grill closed to keep temperature constant. P.S. 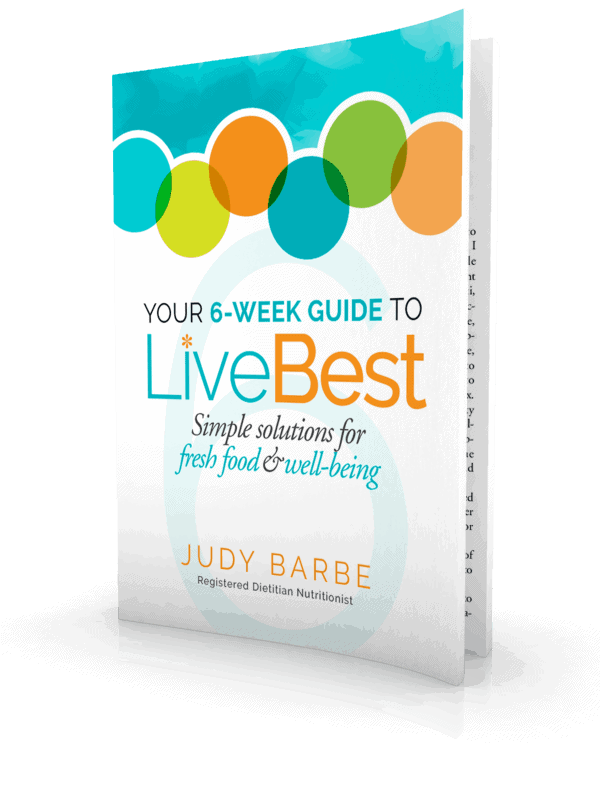 Want more healthy tips and recipes? Sign up for my newsletter right here. 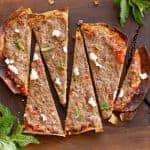 Grilled Turkish Turkey Flatbread is fast, delish and nutrish! Heat: grill and cast-iron griddle to 350° F degrees. Turkey: In a large bowl, combine ground turkey, red pepper, onion, ginger, cumin, red chile flakes and 1/2 cup mint. Divide turkey mixture into thirds. Press mixture evenly over three flatbreads. Be sure to go clear to the edge. Cook: Place flatbread on grill grates (using indirect heat) or cast-iron griddle. Close lid. Grill for 12-15 minutes until edges are crisp. Or bake on a baking sheet in 350° F oven for 12-15 minutes. Sprinkle with goat cheese and remaining 2 tablespoons fresh mint before serving. Slice into wedges. If you have leftover turkey, consider Spicy Turkey Sliders. I use a Lodge cast-iron griddle like this. I cut pizza and flatbread with a rockin’ pizza cutter like this. Serving beer with your flatbread or pizza? You may like a chilled pilsner glass. 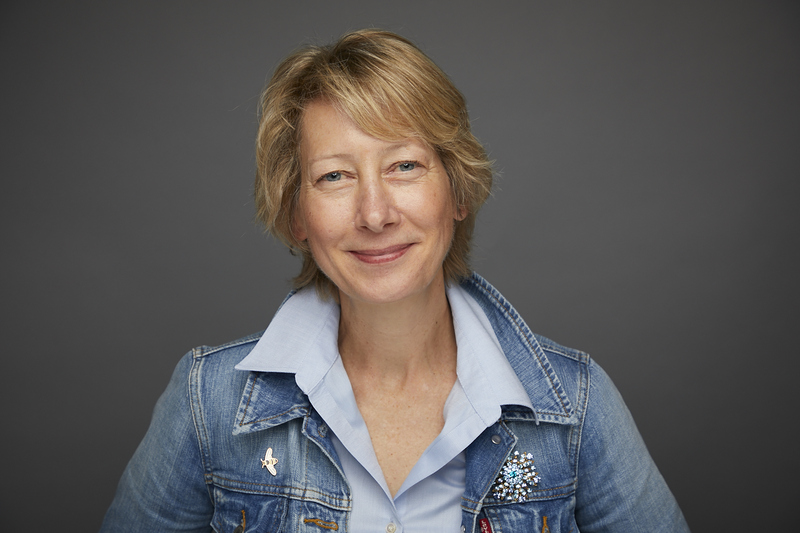 My website contains affiliate links. That means if you click through and make a purchase, I may make a commission which is paid by the seller, not you. It does not increase the price you pay.